Explore Provence on a wine tour. Cycle the Tour de France race route. Head towards the Mediterranean sea for a beach holiday. The Vaucluse department in southeast France has many reasons to visit for a short break. If your stay is brief but perfectly formed, Domaine de la Verriere provides bed, breakfast, meals, and activities, in a luxurious setting you’ll probably find hard to leave. Alternatively, stay a while, treat this eco-luxury private countryside resort and winery as your home from home, and book the whole house exclusively. The manor has seven comfortable guest rooms and suites for up to 18 guests (including children), each decorated with Provencal themes and furnished with the finest bedding. This is a holiday destination best suited to people who appreciate seclusion; who are sensitive to the beautiful surroundings and biodiversity; who connect with the concept of harmony that exists here. There is harmony between the vineyard and the forest; between the people and the land; between the hospitality and the wine. These sustainable relationships are unique as they have not yet been applied to viticulture in such as systematic way. Maintaining this balance is at the forefront of La Verriereʼs collective mindset. Staff and guests have a mutual understanding of their part to play in this story. For example, local and homegrown produce is used as much as possible in the kitchen; the best soil experts in France help to care for the microbiology of the organic and biodynamic vineyard; and bamboo forests have been planted next to The Winery to filter water waste back into the land. The Knights Templar who lived here centuries ago spoke of the invisible forces at this special location, where celestial energies came down to earth to link up with their terrestrial counterparts. Likewise today, weary city dwellers find the wild environment a helpful antidote to the pressures of modern living and leave exalted, regrouped, focused, and in the moment. Completely hidden in a mountain saddle, with panoramic views of rolling hills, La Verriere rests high above the fertile plain of the Ouveze river, replete with olive groves, apricot orchards, lavender and sunflower fields. It is a serendipitous converging of voluptuous topography, protected micro-climate, fruitful lands and abundant water. The pavilions of Domaine de la Verriere were restored with great care to protect the architectural harmony, historical authenticity, and compatible landscaping. Rough hewn stone walls and vaulted rooms bear witness to 11 centuries of the siteʼs history. Modern elements of comfort have been discreetly incorporated throughout. The ancient sections of the interior have been meticulously restored to combine 9th-century charm with 21st-century comfort. In main house, the spacious Grand Vaulted Hall is a logical venue for cocktail and dinner parties, meetings and themed events. The space is easily adapted to accommodate your seasonal or period themes, from Medieval feasts to modern, stylised, Provençal repast. Thick stone walls keep the spacious room cool in summer. A roaring fireplace, plus under-floor heating, provide cosiness in winter. Find more about the facilities on the site. Outdoor facilities for leisure, meetings, dining and entertainment offer a variety of choices when planning events. Woodhenge, for example, is a shaded circle of arched oak benches, one of a number of agreeable outdoor locations for gathering family, friends, colleagues and associates for meaningful conversations. Swimming pool: 20m Long x10m Wide, Depth: 0.25m to 2.1m with clear markings. The heated pool is normally at 28°C (82°F) or more in the height of summer, but can vary considerably depending on the weather. In early spring/late fall up it can drop to 17°C (63°F). Find out more about things to do outdoors during your stay in this lavish organic terrain. The lines between fantasy and reality are already blurred when staying at La Verriere. The home cinema boasts more than 200 DVD and Bluray movies to choose from, in many languages, screened on an oversized HD television allowing you further scope to unlock your imagination. This comfortable room, available twenty-four hours a day, has Medieval-inspired frescoes depicting the four seasons at the estate. The satellite TV and audiovisual equipment also broadcasts international TV stations, and a Wii games console can be connected to the screen. While the mind escapes and seeks adventure, the body can still exist, exuberantly, in the present. Push your physical boundaries to the limits in the private gym, equipped with a dance bar, free weights, yoga mats, and coaching DVDs for cardio workouts and strength-building pilates. Fitness circuits and water aerobics tuition can also be arranged. 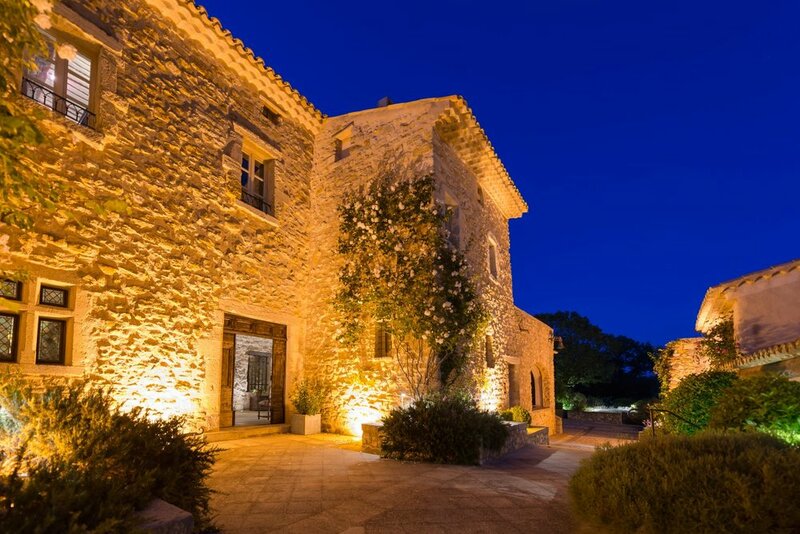 La Verriere sits in a secluded mountaintop surrounded by pristine Nature snd vines, at the foot of the Saint Amand and in clear a view of the summit of the Mont Ventoux far, away from the madding crowds. Yet, it is actually at the heart of onw of the most dynamic and culturally rich regions of France-- an abundance of historical sites and enjoyable A 15-minute drive away lies the bustling Provencal market town of Vaison la Romaine. The historical town of Carpentras lies to the south, en route to the Luberon Regional Nature Park, known for its lavender fields. Other highlights worth visiting nearby include the views from Mont Ventoux, the Medieval town of Avignon, and the impressive rock formations of Dentelles de Montmirail. Explore the regionʼs dramatic landscape on a day trip from La Verriere.